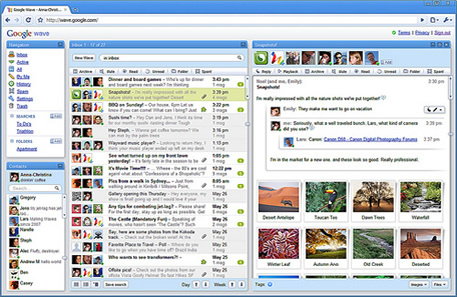 The web community is awash with excitement at the latest ‘killer app’ to come out of the web industry behemoth Google. It’s named Google Wave and has been met with a very positive reaction from designers, developers and industry experts alike. So what is Google Wave? Well, in it’s simplest form it can be described as a mix of e-mail, instant messaging and real-time collaboration tools in one simple browser-based application. Google describe it as a ‘new tool for communication and collaboration on the web’ and it has been built by the engineering team over at Google, led by the brothers behind Google Maps, Lars and Jens Rasmussen. Google have described Wave as the answer to the question ‘if we invented email today, what would it look like?‘. Google Wave is real time, mobile and social, three of the hottest trends in both Internet technology and engineering in the industry at the moment. Wave allows you to store personal content such as conversations, emails, twitter messages, pictures, video, documents and share this information with people and other social services through the use of developer-made tools. Google Wave wants to change the way we use email in making it completely dynamic, allowing for the splitting, commenting, adding and editing of any ‘wave’ taking place. Respond to a certain sentence within an e-mail or ‘wave’, not just to the e-mail itself (effectively commenting on any part of the email you see fit). Real-time conversations in instant messaging i.e. no more ‘your friend is typing’ messages, you see characters on your screen as they are being typed on the other persons. A ‘playback’ feature allowing you to see how an e-mail or conversation has progressed step by step. Collaboration through documents allowing editing of wiki-style documentation. Drag and drop files directly into Wave and have them uploaded ready for download from other Wave friends and users. Real-time interaction with your blog i.e. upload some holiday photographs to your wave and they will instantly appear on a blog you specify, this can also be done with text. The tool also contains a very advanced spell checking and link detection tool which can dynamically detect when you insert text intended to be links as well as already including Google Map, YouTube and Twitter functionality directly in the Wave. Google Wave is due for release in the final quarter of this year but many are already expecting it to revolutionise the way many people and organisations communicate with one another.